Confederate statues are being removed around the U.S. under pressure from those who say they honor a regime that enslaved African-Americans. The pace of the removal of Confederate monuments has increased in the wake of the deadly confrontation at a white nationalist rally in Charlottesville, Virginia. Here's a look at some of the statues and monuments that were removed and some that protesters say need to go. Above: Marchers at a "Unite the Right" walk past a statue of Confederate Gen. Robert E. Lee on Aug. 12 in Charlottesville, Virginia. The rally, held to protest the slated removal of the Lee statue, ended in a woman being killed and at least 19 others wounded after a man plowed his car into a crowd. Workers prepare to take down a statue of Confederate President Jefferson Davis on May 11, 2017. The statue is the second of four monuments that the city removed because it said they fail to "appropriately reflect the values of diversity and inclusion that make New Orleans strong today." A statue of Confederate Gen. P.G.T. Beauregard is prepared for removal from the entrance to City Park on May 16. A statue of Confederate Gen. Robert E. Lee is removed on May 19. The top section of a Confederate statue called "Johnny Reb" is loaded on a truck before being removed from a downtown park on June 20. The statue will be relocated to a Confederate section of a nearby cemetery. Marc Rodriguez stands with other activists as they protest to have a Confederate monument removed at the old Hillsborough County Courthouse on July 18. Workers begin removing a Confederate statue on Aug. 14. The statue is being returned to the local chapter of the United Daughters of the Confederacy, which erected the bronze statue in 1904. Demonstrators light candles on Aug. 13 in front of the statue of Confederate Gen. Albert Pike, the only member of the Confederate military with an outdoor statue in the U.S. capital, during a vigil in response to the death of a counter-protester at the rally in Charlottesville. A protester kicks the toppled statue of a Confederate soldier outside a courthouse after it was pulled down with a rope by activists on Aug. 14. A municipal worker attempts to remove paint from a vandalized monument dedicated to Confederate soldier John B. Castleman on Aug. 14. A monument to Confederate Gen. John Hunt Morgan stands encased in a protective scaffolding because of nearbyconstruction outside the Old Courthouse on Aug. 15. A Confederate statue in Piedmont Park is splattered with red paint after being vandalized on Aug. 15. City workers use plywood panels to cover the Confederate Monument in Linn Park on Aug. 15 on orders from Mayor William Bell. 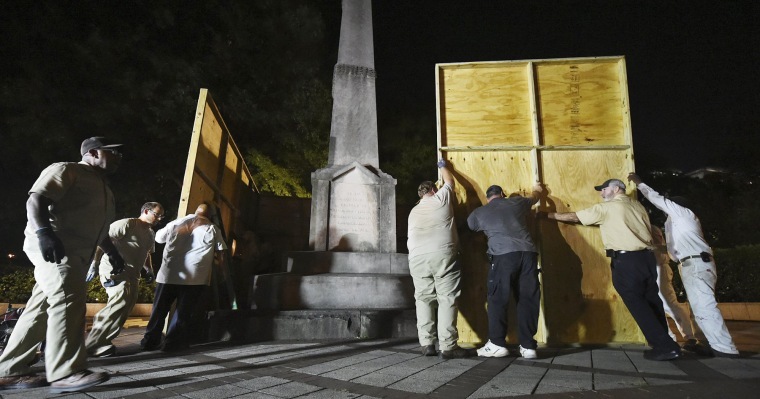 The cover-up prompted a lawsuit by Alabama's attorney general, who argues that it violates a new law prohibiting the removal of historical structures, including rebel memorials. Workers remove a monument dedicated to the Confederate Women of Maryland on Aug. 16. Workers remove a statue of U.S. Supreme Court Chief Justice Roger Brooke Taney from outside the Maryland State House on Aug. 18. Taney wrote the 1857 Dred Scott decision that upheld slavery and denied citizenship to African Americans.